Halloween is a holiday for enjoying all things scary, but also a great opportunity to dress up and have some fun. When you spend Halloween at Universal Studios Japan you can get your fix of both with their Halloween 2016 Reborn/Horror Nights activities. By day, flaunt your best costume, grab some candy, give wizard Snoopy a hug, then dance your heart out in the Reborn Anniversary parade. But once night falls, prepare to battle chainsaw-wielding zombies, cursed dolls, Harry Potter Death Eaters, and whatever else is awaiting you in the hospital ward of horror. 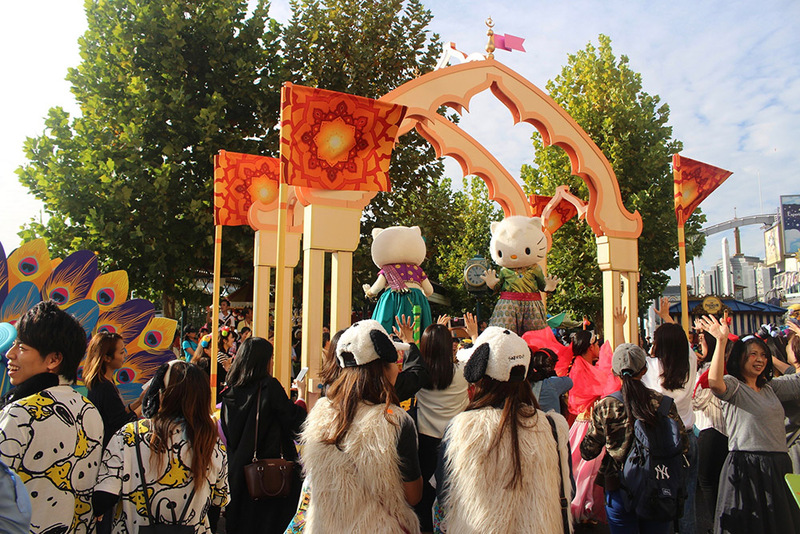 If you want to survive the day, here are my top tips to make the most of your Halloween USJ experience! It will be busy. Plan what you want to see before you go and write out a loose itinerary, and expect to have to navigate through crowds and queue for things. Also, some of the Halloween events require special passes which you can buy at the ticket gate or once inside the park. But these sell out quickly, so if there’s something you definitely don’t want to miss then arrive early! In the evening, zombies will patrol most of the streets. They will also spontaneously perform the dance from Thriller, so watch out for that. If the zombies are just too much nope, you can go to the Wonderland zone or the street directly in front of the main entrance as these are zombie-free. There are also warning signs in areas which have zombies, so you know what you’re going into. Japanese people go all out when it comes to costumes. It’s fantastic to see all the different styles, cosplays, cute fashions, and just plain crazy outfits (like people dressed as parsnips…) It’ll be tons more fun if you take part as well! It’s just part of being in the excitement of Halloween at Universal Studios Japan. Get to the parade route early. It will be busy, and if you want a front row position you’ll need to stake one out in advance. Sitting on the floor isn’t a favorable thing to do in Japan, so take a plastic tarp or blanket to sit on or prepare to stand for awhile. When the parade comes, it will stop periodically and you will be showered with confetti, and then dragged into a dancing mob by Hello Kitty. For some of you, this may sound scarier than the zombies. But just go with it. You’re in Japan. Obey the Hello Kitty. After the parade, there will be lots of confetti lying around on the streets. Pick it up, throw it over yourself and your friends, and take some fun photos! Selfie sticks are a blessing for this. The Harry Potter Death Eaters event is one which requires a special pass. Get one early in the day to avoid disappointment. Also, if it’s extremely busy, you will need a time slot ticket to access the Harry Potter area in general. I recommend going to it first, in case it becomes ticketed later in the day. It would be annoying if you got a time slot for it which clashed with other things. And be sure to pick up an interactive wand! They are so much fun! Love Harry Potter? Have you been to Diagon Alley at Universal Orlando Resort? If you get a twilight ticket & enter the park after 3pm, it’s cheaper. This is a great option if all you want to see is the scary stuff, as that doesn’t begin until 6pm. But be aware that some of the aforementioned passes might be sold out. If you’re planning a visit to USJ for these Halloween frights and delights, they will be running until November 6th 2016. How to get there: USJ is in Osaka City, Osaka Prefecture. It’s easiest to go from Osaka/Umeda station. Take the Osaka Loop Line towards Sakurajima. This train goes direct to Universal City and only takes around 15 minutes. The full Halloween at Universal Studios Japan 2016 program is available on the Universal Studios Japan website.